With the growing threat from malicious advertisements, tracking, and a general loss of online privacy, protecting yourself online is now more important than ever. Ad-blockers, browser extensions, and other privacy tools are available, but there hasn’t been a good all-in-one solution… until now. Enter the eBlocker. This smart device plugs into your router and provides a powerful and highly customizable privacy and security solution for all your devices. In a world of mass online surveillance, advanced tracking, malware, and obnoxious advertisements, the eBlocker is a great all-in-one solution. The main drawback is the price, at around $200. But as with all things, you should consider the value of the product – what you get for your money. In this review we’ll cover all of eBlocker’s unique features as well as the different alternatives currently available. Is eBlocker the right choice for you? Continue reading to find out. eBlocker discount: You can get $25 off the purchase price by visiting eBlocker using the button below and then entering the discount code rp25off at checkout. You will also get a 30 day money-back guarantee. eBlocker is a simple plug-and-play device that integrates with your router to block ads, stop trackers, hide your IP address, and protect all your devices without separate software installations. It provides a number of customizable privacy and security solutions right out of the box, which we’ll cover in detail below. Setup is simple: connect it to your router and it starts working immediately. Here’s the eBlocker that was tested for this review. As you can see, this is a small and simple device, but it has many powerful features. One of eBlocker’s biggest advantages is that it offers blanket protection for your devices. It does this through integrating with your router, and thereby protecting all devices on your network, without the need of installing software. eBlocker is especially suited for people who want a simple solution to protect everything on their home network. You’ll save time and stress with eBlocker, because you won’t have to hassle with separate software installations for every device. Companies are increasingly using aggressive/malicious surveillance and tracking techniques to monitor and record your online activity. The dangers of malicious advertisements also continues to grow. Hackers are using ads as attack vectors to infect devices with malware, spyware, and ransomware (no clicks required!). eBlocker is perfectly equipped to handle these trends. Why are there so many dangerous ads? Ads are simply a tool to take your data, track your activity and behavior across the internet, and sell you more stuff. Your data is valuable because it allows companies to target you with ads, charge you more for online products, and monitor/predict what you do online. Ads are also attack vectors for installing malware, spyware, and ransomware onto your devices. Malware can be hidden in ads and then loaded onto your computer when you access a web page (no clicks required!). Many major websites have been hit with this problems, from the New York Times to BBC. Security experts are sounding the alarm because the “bad ad” statistics are getting worse every year. Think of every ad as a digital surveillance camera – quietly recording every little detail about you and your activity. Experiencing the internet without all the annoying ads, trackers, pop-ups and click-bait spam is like a breath of fresh air. 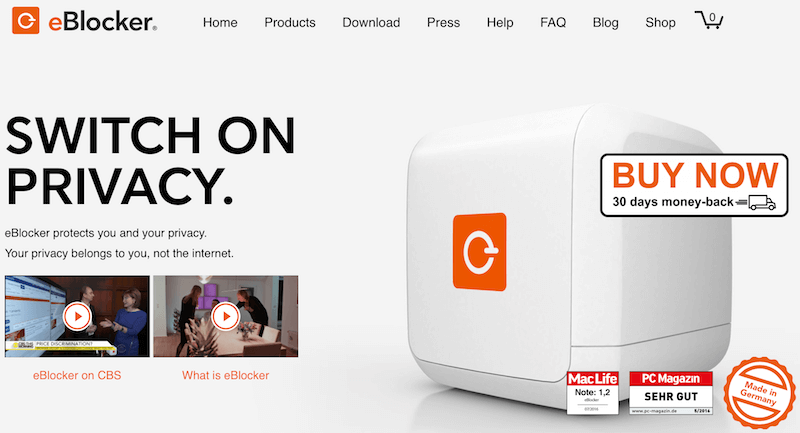 Within your internet browser, on any connected device, you can click the small orange icon in the top-right corner to reveal the full eBlocker dashboard. The eBlocker control bar provides you with real-time trackers and ads that are being blocked for every website. You can also access all of the privacy and anonymity features within your browser. 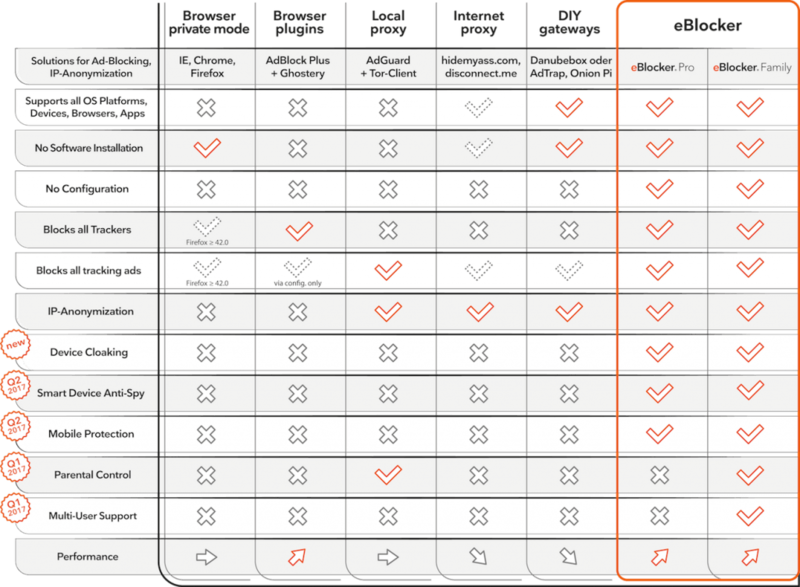 Despite eBlocker being simple and user-friendly, it also offers many advanced features. Every device that connects to the internet has a unique IP address. By anonymizing (or hiding/replacing) your real IP address, you can achieve a higher level of anonymity online. Aside from providing more privacy, hiding your IP address also allows you to access blocked content and anything else that is geographically restricted. The Tor network, which is configured with the eBlocker by default. A VPN (virtual private network), which is a service you would have to purchase separately. In testing out eBlocker with Tor, I also identified IP address leaks. This is a known issue with Tor and has nothing to do with eBlocker. For both privacy and performance, you would be better off using eBlocker with a good VPN. Configuring an eBlocker with a VPN provides you with a number of advantages in terms of privacy and security. With this option, every device that connects to your router/eBlocker will have its IP address hidden and replaced with the VPN server’s IP address. This provides you with a high level of anonymity and security whenever you connect to the internet through your router/eBlocker setup. Installing a VPN onto eBlocker is fast and simple with the configuration wizard. Just access the IP-Anonymization tab in the Settings area, select VPN Network and then New VPN Provider. All you need is the OpenVPN configuration files from your VPN provider, your username and password. Here you can see there are four different Perfect Privacy VPN servers added to my eBlocker. This only takes a few minutes. Once installed, you can connect to any of these different servers with one click in your eBlocker dashboard. Advantages – Installing a VPN directly on to your eBlocker allows any device in your household to utilize the VPN network. This is a big advantage because normally you would have to go through separate software installations for all your different devices. In testing download speeds, there weren’t any noticeable delays or connectivity issues (but this can vary depending on which VPN provider you choose). In testing for IP address leaks, eBlocker with Perfect Privacy was very secure. Here are the IP leak testing results when connected to a VPN server in Amsterdam. As you can see with these results, eBlocker works very well with Perfect Privacy VPN. Another nice feature eBlocker has is the ability to cloak (conceal) the true identity of your device. In other words, if you’re using a MacBook laptop, you can instead choose to cloak your online identity with a different device, such as an Android or Windows PC. Simply select the device you want from the eBlocker dashboard. Device cloaking is also a trick to save money online. Try using different devices, and clearing your history/cache after every search. You might be surprised by the results. One of the biggest reasons to use cloaking is to save money with online purchases. Many companies use algorithms and tracking to determine the maximum price they can charge you based on your operating system, browsing history, and unique profile. Changing prices for different people buying the same thing at the same time is known as price discrimination – and it affects everyone. 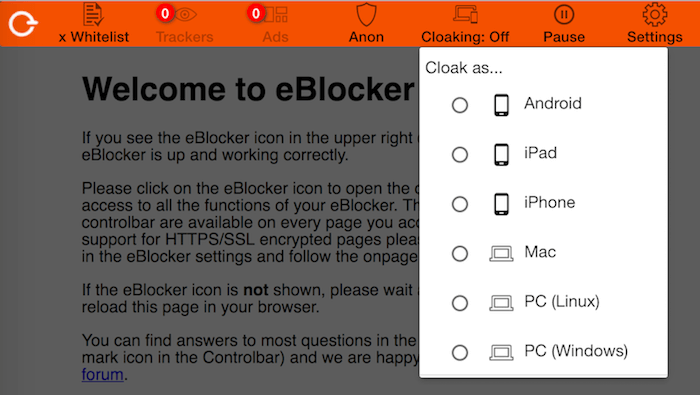 Using eBlocker’s cloaking option can potentially save you a lot of money, especially on expensive items (such as flights and hotels). Another reason to use device cloaking is for added privacy. I tested eBlocker’s cloaking ability at amiunique.org – which creates a fingerprint based on your browser, operating system, and other inputs. When using a Windows PC, I was able to successfully cloak my operating system and browser using all the different options (Android, Mac, Linux, iPhone, iPad). eBlocker’s cloaking feature worked perfectly. eBlocker is currently offering a discount to RestorePrivacy visitors. Purchasing through the links/buttons on this page and using the eBlocker discount code rp25off will give you $25 off. After you order your eBlocker, you’ll get a small package including: the eBlocker, power cord, outlet adapters, ethernet cable and paperwork (license key and manual). 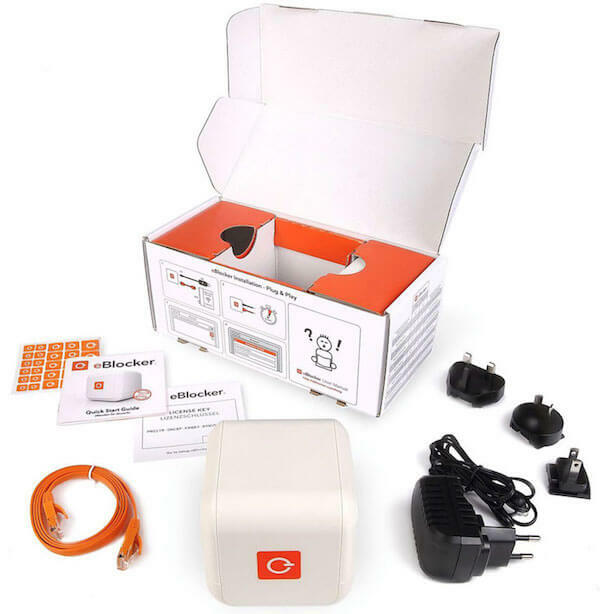 Connection – First, connect your eBlocker to your router or switch, with the orange LAN cable. Then, connect your eBlocker with the adaptor and the power supply. Start – The eBlocker icon should now appear in the top right corner of your browser. Click on the icon to open the dashboard. Then click on the Settings (gear icon), enter your information and enjoy your new eBlocker. eBlocker comes with a one year license, but you also have the option to purchase a lifetime license. Tip: if you’re having any issues with setup, you can probably find all the answers you need in the instruction manual or support forum on the eBlocker website. Various browser plugins – There are a variety of free browser plugins to block ads, but they come with some tradeoffs. First is the trust issue with some of the free solutions – which may be selling your data. Second, this solution won’t work well for all browsers and all devices. Third, by installing more extensions/plugins you will actually be easier to track and identify due to browser fingerprinting. VPN with a built-in ad-blocker – Using a VPN with a built-in ad/malware-blocker is a good option, but it has some drawbacks. The main trade-off is that you won’t get all the other features that go with eBlocker, such as device cloaking, whitelist options, and real-time ad and tracking stats. The only VPN that offers a powerful and customizable advertisement, tracking, and malware blocker is Perfect Privacy, with the TrackStop feature. VPN on a router for protecting multiple devices – The closest option to an eBlocker would be installing a VPN on a router. If you did this with Perfect Privacy, and then activated the TrackStop filter, then your entire network would be protected against ads and tracking (you can also filter social media tracking as well). While it is fairly expensive, it’s clear that eBlocker offers many advantages over other alternatives. Support – I found the support department to be fast and helpful. I tested all the features for this eBlocker review and asked the support team many questions. My questions were usually answered in under 24 hours. If you’re looking for a complete privacy solution that is simple, powerful, and capable of protecting all your devices, then eBlocker is for you. eBlocker’s support team is also top-notch, providing fast and helpful assistance if you need it. You can try eBlocker risk free with a 30-day money back guarantee. Also, you can get $25 off by using one of the eBlocker links on this page and then entering the coupon code rp25off at checkout. Sounds like an interesting device, but a liscensing fee is hard to swallow on top of the $200 cost for the physical device. I can deal with a large upfront cost for a device I will own, but not interested in paying exta on top of that, just seems greedy to me. We ‘cut the cord’ with our cable company (all but one tv) when they started making us rent ‘boxes’ to get the channels we PAY for, and if other family members would allow it I’d get rid of the rented modem too. So not a fan of extra fees. I will look at the lifetime liscence cost but will not be buying anytime soon. I am more interested in a whole home network vpn solution anyway, so I’ll check out your articles on those.Thank you for the thorough review! What about privacy? Since all trafic will come true the box are they doing anything with it. Logging? That said… this has turned into a true love-hate relationship!!! Love: because of the aforementioned reasons. Hate: because I actually tried it out. Hi George, I think the “plug and play” compatibility and user-friendliness has a lot to do with the router you are using. If you can’t get it working well you always have the 30 day refund window. Hope it works out for you. Yup… I see how a router could be an issue. Mine is a 1 year old Airport Extreme which the eBlocker site says works fine with their stuff. Unless you are talking about the gizmo that connects the cable of the microwave dish to my own router? So… direct line’o’sight tower-microwave is the only option I have. What’s your take, if you don’t mind, on my situation??? Hi George, yes the Apple Airport Extreme should work with the eBlocker without any issues. It is listed on the eBlocker site as fully “plug and play” compatible, so I’d just follow the installation instructions as normal with the Airport Extreme. The eblocker vpn has some issues. I am pp subscriber, set more .ovpn from pp into eblocker, tested, on more test dns leak test sites and i have dns “flow”. With pp application, no dns or ip leak. Hi Zoli, interesting, I no longer have an eBlocker to test out so I can’t help you with that. I’d send the eBlocker guys this question. Is eBlocker only protecting WiFi-connected devices or does it also protect wired devices such as TVs and desktop computers? Does it install between the isp and the router or between the router and the switch? Would it work if I have a domain controller running windows server 2012r2 ? How does it interact with DNS and DHCP ? To re-route thru eBlocker I assume that eBlocker would have to become the gateway, correct? Hi Bruno, it’s been a while since I tested out the eBlocker, and I understand they have rolled out some new updates and improvements to the device since then. I’ll look into this a bit more and then update this comment. You could also email the eBlocker team directly through their website. 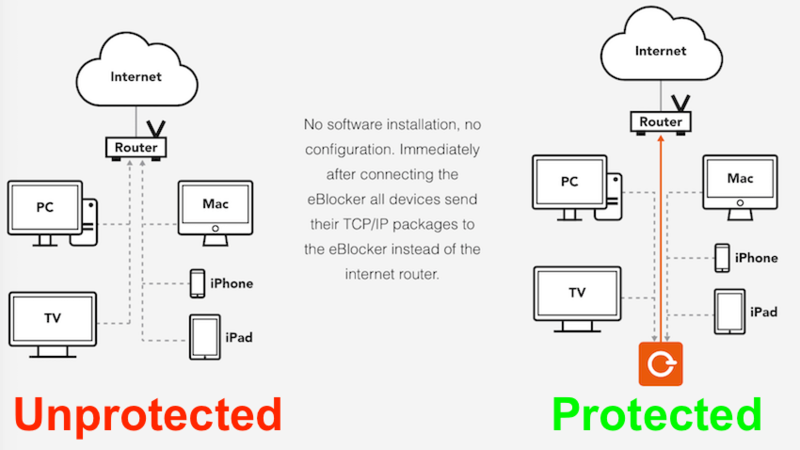 1) eBlocker protects all devices connected to the router, whether via wireless or ethernet cable. It depends on the network configuration. The eBlocker can only handle one IP range. For example from 192.168.1.2 to 192.168.1.254. The eblocker will also work only if the official private network IP ranges ( Wikipedia: https://en.wikipedia.org/wiki/Private_network ). So if your IPS installed a modem, then you connected your router to the modem and you can connect the eBlocker to your router. We recommend to direct connection, but you can also connect the eBlocker to a switch, which is connected to your router. In this case the network connection will slow a bit down (milliseconds), but as far away you place the eBlocker, the communication will need longer (again in milliseconds). Connecting the eBlocker direct to your router is the best way. The eBlocker will work with most Access Point, but will cause problems with WiFi Repeater. WiFi Repeater will replace the clients MAC-Adresse with it’s own MAC-Addresss, but eBlocker (like other network devices) will work only correct, when the real Mac-Address will be transmitted. In the eBlocker Devices settings you can deactivate the eBlocker for Devices. The eBlocker should be compatible with Windows Server, when you deactivate the eBlocker for this Server. But this sounds a bit like you own a bigger network. The eBlocker Pro or Family could cause trouble in bigger networks, because they are designed for home usage. We start working on an eBlocker Enterprise, for small and medium sized companies. Hi Chip, the eBlocker team should be able to help you if you lose passwords or need help. Hi Kevin, I found it to work well, but it is mainly an ad-blocker. For more privacy and encryption, using a VPN on a router may be a better option. Is ebloker only protecting wi-fi? If the mobile only writes data that is not wi-fi, is eblocker unusable? Hi Jackson, eBlocker currently only protects devices that connect through your WiFi network. However, I found on their website under the FAQ section that they are planning to add mobile support later this year. What that exactly means, I do not know. You can reach out to eBlocker and they could clarify.